Cancer remains a leading cause of morbidity and mortality world-wide. It is estimated that at least 14.1 million people are diagnosed with cancer every year and it currently accounts for at least 15% of all human deaths. Recent advances in modern medicine have significantly improved the cure rates over the last few decades, but an increase in adverse drug reactions (ADRs) has been seen with the increased intensity of treatment. Anthracycline-based cancer treatments are highly effective for many types of cancers, especially childhood malignancies and breast cancer and have significantly improved the 5 – year survival rates of many cancers from 30% to greater than 80%. However, the use of Anthracycline-based cancer treatments is being questioned due to a highly individualized ADR, cardiac toxicity. In order for Anthracycline-based cancer treatments to remain on the market as highly effective therapies for many severely ill patients, it is imperative to identify the inherited genetic predispositions causing these ADRs, build an ADR prediction algorithm and implement this in a cost effective pharmacogenetic ADR prevention program. The ultimate goal is to tailor the right treatment to the right patients and improve the safety of these medications currently on the market. 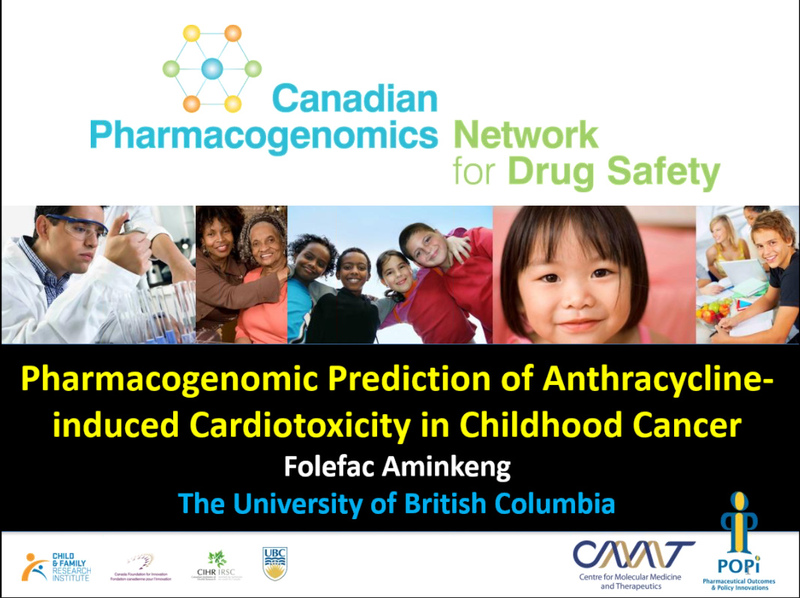 The Canadian Pharmacogenomics Network for Drug Safety (CPNDS), recently discovered a novel gene (RARG) responsible for cardiomyopathy and congestive heart failure in cancer survivors and has developed clinical practice recommendations for genetic testing to reduce the incidence of anthracycline-induced cardiotoxicity in children after cancer treatment. Join us as Dr. Folefac Aminkeng, presents the CPNDS’ important research efforts focused on understanding the role of genes in ADRs and developing drug safety solutions for cancer patients, initiatives which are critical to improving long-term survival outcomes. Dr. Folefac Aminkeng is a Postdoctoral Fellow at The Centre for Molecular Medicine and Therapeutics (CMMT) at the University of British Columbia in Vancouver, BC. Dr. Aminkeng’s research focus is the pharmacogenomics of adverse drug reactions. Dr. Aminkeng and his colleagues at the Canadian Pharmacogenomic Network for Drug Safety monitor for adverse drug reactions, identify genetic markers that are predictive of severe adverse drug reactions and implement these in a cost-effective diagnostic screening program to reduce the occurrence of disability and deaths. His abstract, Pharmacogenomic Prediction of Anthracycline-induced Cardiotoxicity, was also featured in Nature magazine.